As I am diving further into beauty I thought I share and to show you my recent natural skincare product purchases. I was never really a makeup or beauty junkie, I had my basics and that was good enough for me, but the more I blog and read/watch/talk to my fellow bloggers and gal pals the more excited I get about beauty products and finding what works and what doesn't for my sensitive skin. 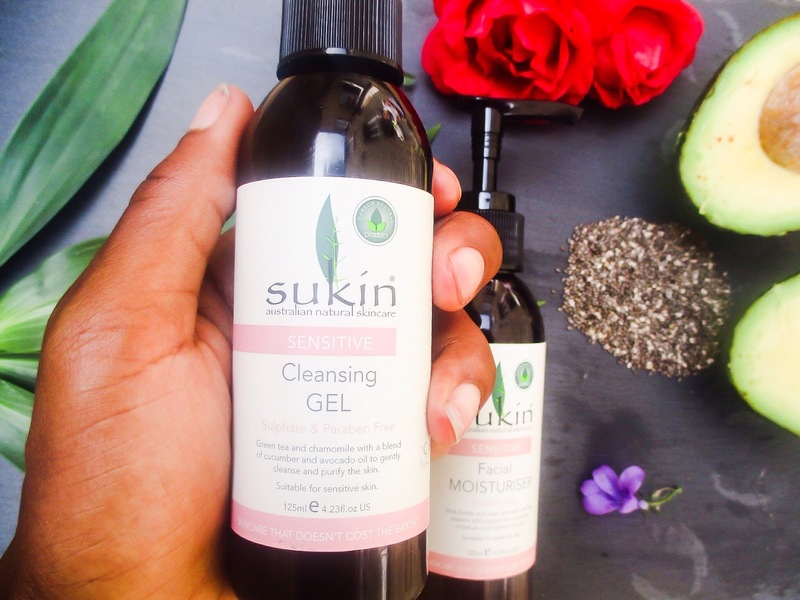 I was first introduced to this Australian brand Sukin Organics from a friend, she was actually using their shampoo and conditioner and it was clearly visible the amazing effects that it had on her hair. So I went on a hunt for this brand, luckily enough for me and surprisingly it was stocked in TK Maxx not just hair care, but a skincare range also, they had a few ranges and I opted for the sensitive skin range, it only makes sense and thought I'd give it a go. The packaging is ok, keeping in line with the standard range, only real difference, which is a good thing the colour to highlight that this is from their sensitive range. 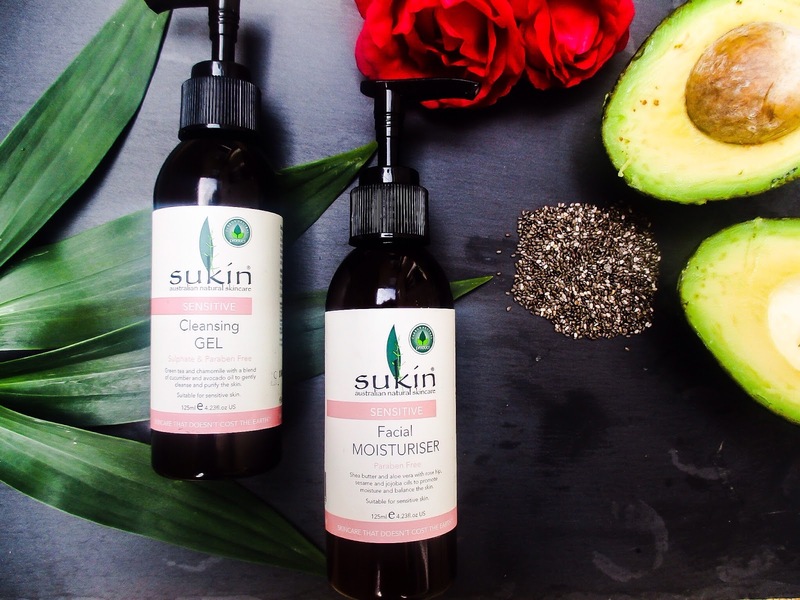 All Sukin products which I personally think is brilliant, as a few companies not naming, but I'm sure you beauty lovers know that still do this which is totally disgusting animal testing, Sukin are totally against this and on each product it tells you so, plus also its 100% Vegan and no added parabens and loads of other no added chemicals. Following the instructions on the bottle, I apply a small amount in the palm of my hand and massaged into circular motions over my face and neck. This product has a kind of natural scent, not much going on so do not expect much from it, but it is a natural product after all. The ingredients it does contain is Green Tea and Chamomile with a blend cucumber and avocado oil. once massaged and worked up a lather on my face I rinsed off with warm water and patted my face dry. I did notice my face looked fresher and somewhat purified and tighter which is obviously a result that I want and I also did not feel that my face needed a second cleanse. Overall pleasurable to use. I am a big cream person, it is the one thing that is most important to me for my skincare routine, as well as face oils, but after reading the bottle and it's ingredients I was pleasantly surprised to see that it contains three great oils in the form of rose hip, sesame and jojoba oil. Face now clean I use a small amount, as when I first used I kind of got carried away and pumped twice and that way WAY too much, I must of got distracted by Leanora or my head was in the clouds...Anywho! I massaged this small amount all over my face and neck and my face felt fresh, you can really sense that there are no heavy ingredients, you can smell the shea butter and aloe vera that is also in the blend of this product. The scent is not offensive, but light and organic, however, I did find myself needing to reapply more of the cream 10 mins after as I felt the moisture surprisingly had gone away, I even felt like that the first time I applied with way too much of the moisturizer, so I would certainly recommend in applying a face oil before or be prepared to apply once then apply a short time after. 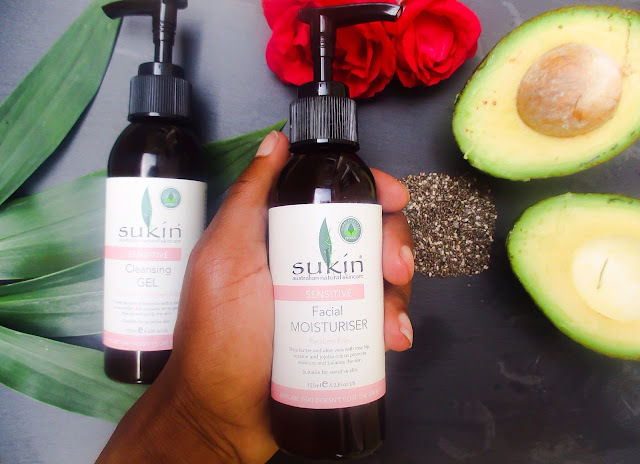 Overall I enjoyed using the Sukin products event though I felt that more moisture was needed in the moisturizer cream, but it's organic, vegan and cruelty from animals as well being sulphate and paraben free and extremely affordable on the pocket. I shall be doing a hair care review soon, so keep checking. Do you guys have any products you think I should try? Let me know if you have you used any of these products and your thoughts. Also, make sure you follow me on Bloglovin for all the latest posts.